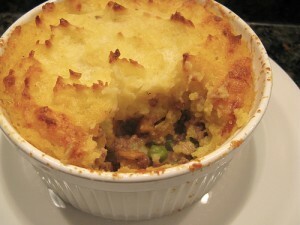 Flaky Shepherd'S Pie recipe by Maryam Burki at DesiRecipes.com. A traditional meat based dish with a topping of mashed potatoes. EXTRA GRATED CHEESE 1 CUP. FRY THE MINCED MEAT WITH RED CHILLIES, SALT , ONION , TOMATO , GREEN CHILLI , GINGER , GARLIC UNTILL MEAT IS COOKED. KEEP ASIDE WHITE SAUCE. MELT BUTTER,ADD FLOUR FRY UNTILL LIGHT BROWN,ADD MILK AND CHEESE AND MAKE INTO A SMOOTH PASTE. KEEP ASIDE POTATO PASTE BOIL THE POTATOES, MASH WITH MILK, SALT PEPPER, UNITILL A THICK LIQUIDY PASTE FORMS. IN A LARGE DISH MAKE A LAYER OF MACRONI, THEN TOMATO KETCHUP, THEN MEAT, THEN WHITE SAUCE, THEN POTATO PASTE AND THE LAST LAYER WITH GRATED EXTRA CHEESE. BAKE IN AN OVEN FOR 10/15 MINS UNTILL THE CHEESE MELTS AND BECOMES CRISPY BROWN. i even tried chicken with this...it was ammmmmmaazzzinnnggg!!!! i'm sorry i didn't understand the methods properly..